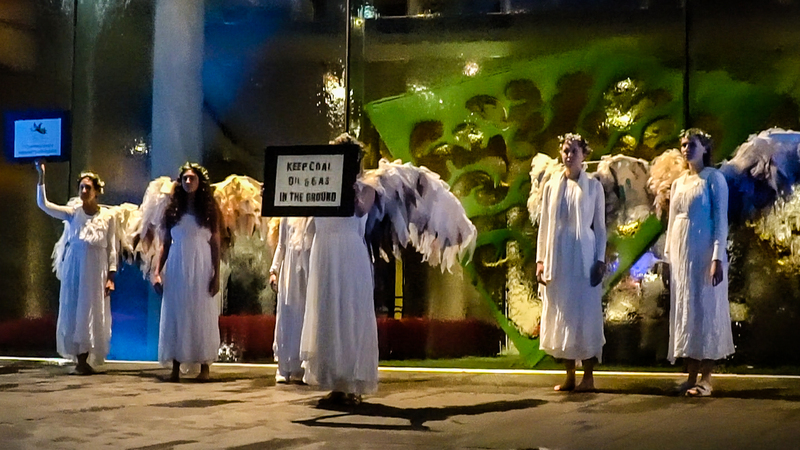 Climate Guardians guard the NGV’s iconic water wall as guests arrive for a ‘high level collectors’ dinner with NGV Board and Foundation members, 5 April 2018. Do you think it’s reasonable for people with long histories of influencing public policies in order to prop up the profits of highly destructive industries to hold prestigious positions on boards and special committees of our nation’s proudest cultural institutions? For instance, the NGV Foundation’s President is Hugh Morgan, a staunch neoliberal credited with having “profound influence” on Australian policy debates. 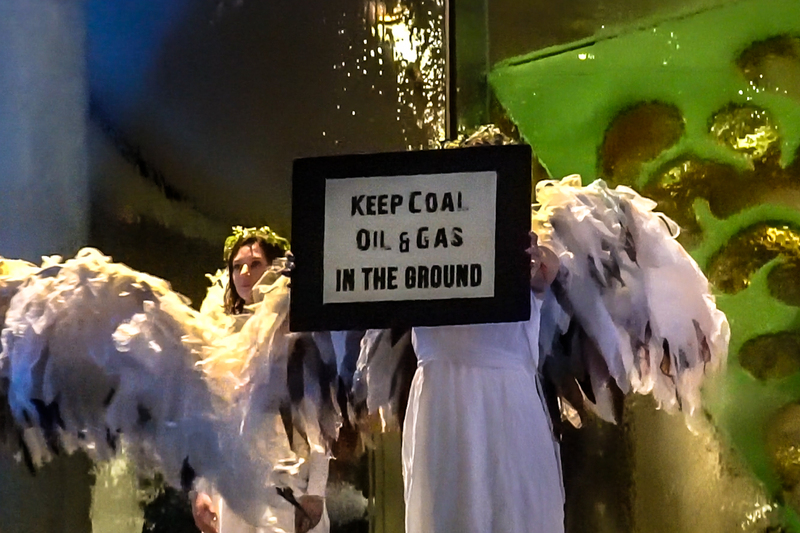 As a key member of the self-titled Greenhouse Mafia, Morgan has reportedly been instrumental in preventing Australian laws to help limit greenhouse gas pollution. Morgan is also recognised for the leading role he has played in the establishment of a number of hard right wing so-called ‘think tanks’ including the Lavoisier Group whose extreme stance on climate change resembles what public intellectual Clive Hamilton refers to in his acclaimed book Scorcher: The Dirty Politics of Climate Change as “a strange mixture of conspiracy and apocalypse”. Extractive and exploitative practices are the antithesis of creative and advancing. Making short-term profits from activities that pollute, poison and destroy the natural world and the fabric of society is wrong. 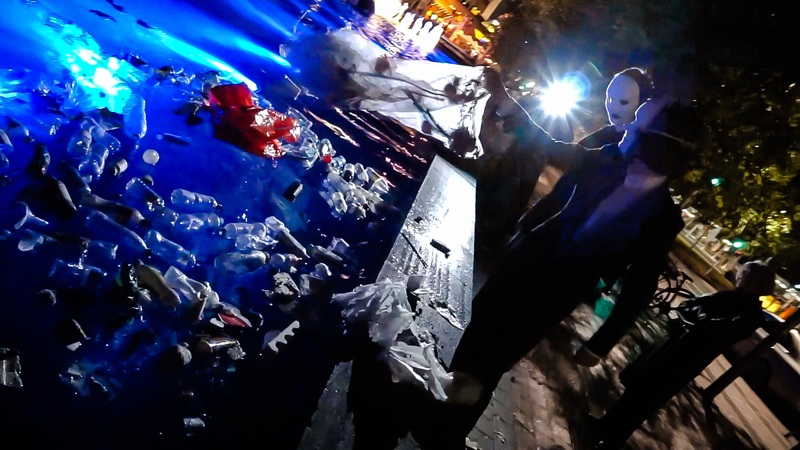 Faceless men dump petrochemical waste that was removed from the Yarra River into the NGV’s moat, a visual motif for the more than 8 million tonnes of plastic dumped into our oceans every year. While the roughly 2000 billion tonnes of human induced CO2 belched into the Earth’s atmosphere (since circa 1850) may be invisible, plastic is not. Our oceans and rivers and landscapes are clearly not filling up with toxic petrochemical waste all by themselves. You may already have seen shocking images of a young sperm whale that washed up on a beach in Spain, having died from nearly 30 kilograms of rubbish that blocked its digestive system. 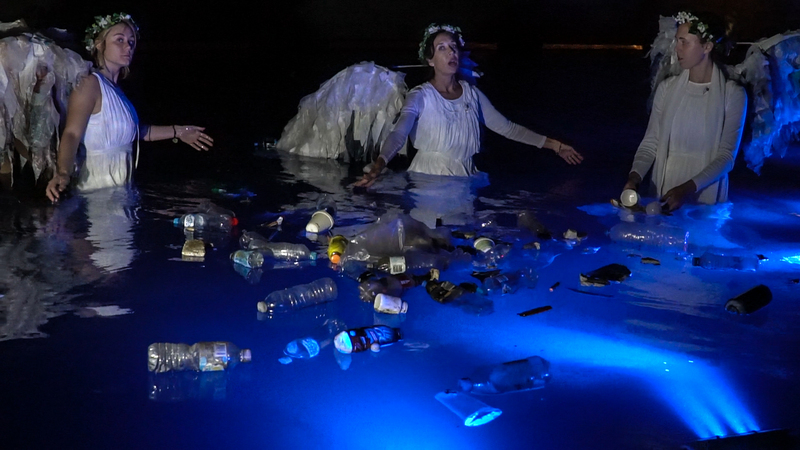 Angels clean up swarms of petrochemical waste that was collected within roughly a 10m stretch of the beloved Yarra river. This plastic was caught in reeds that line Birrarung Marr, Melbourne, before finding its way into the NGV’s moat. 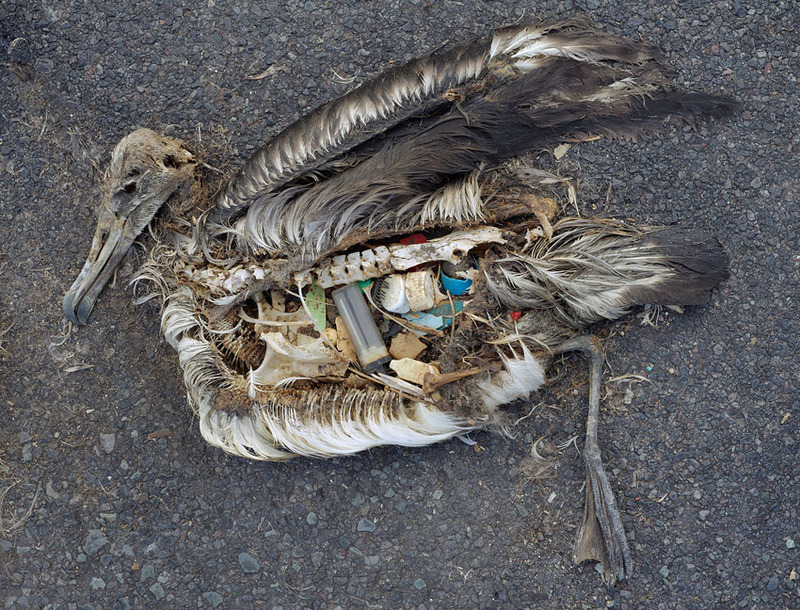 Ending fossil fuel exploitation will end plastic pollution. According to recent reports, fossil fuel companies have invested $180bn in petrochemical plants (since 2010), while the amount of plastic produced in a year approximates the entire weight of humanity. It is as illogical as it is disgusting that these companies are paying nothing towards managing the devastating health and environmental impacts of their toxic industry. Just as they have aggressively stymied renewable energy alternatives to polluting fossil fuels, they are aggressively standing in the way of viable, entirely natural solutions to packaging problems. 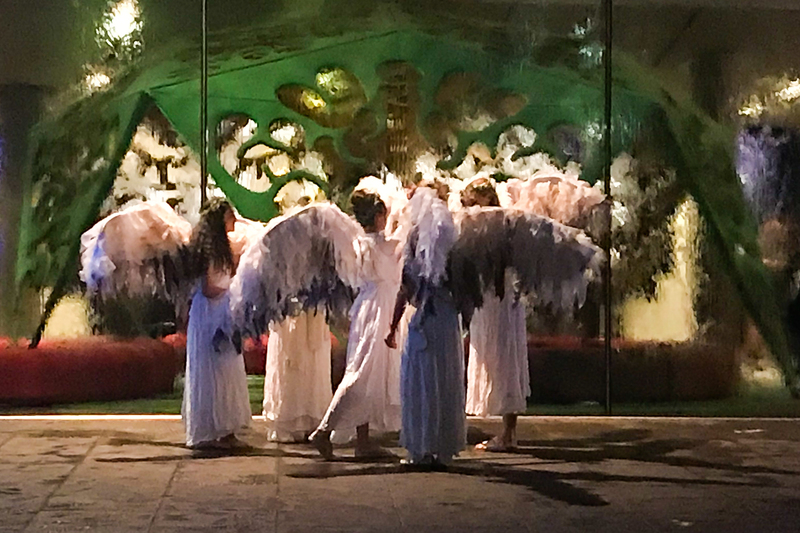 “We’d rather you weren’t in there’ said one police officer, to which Angels responded: ‘Trust us, we’d rather not be in here either! Thanks, officer”. 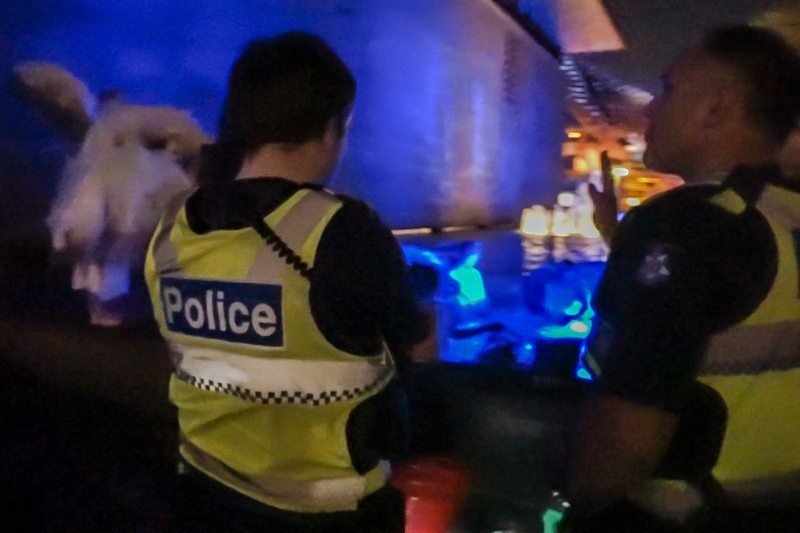 And the officers later thanked us for cleaning up the petrochemical waste harvested from the Yarra. The blind embrace of neoliberal policies that place profits above all else (and starve our vital independent cultural institutions of funding) has led those institutions—critical crucibles in a healthy democracy—to form alliances and host board members from the very industries they exist to critique. Rather than using its phenomenal wealth for the benefit of All, the ‘Big End of Town’ perversely uses the public sphere to bolster its contention that it has a social licence while further enriching its own at the expense of the many, and our global commons. Those making these choices are threatening our democracies in order to continue profiting from dangerously degrading our world. Creative cultural centres deserve visionary and collaborative leaders. People who help enable the pollution and destruction of the natural world have no place in prestigious positions on the Boards of proud Australian institutions. While we applaud the NGV for relatively exciting, dynamic and important exhibitions—such as Melbourne Now and the NGV Triennial which feature work exploring critical global 21st century issues—we also think that it’s high time the likes of Morgan Must Go* from long-held, prestigious positions at the NGV, and the public sphere generally. 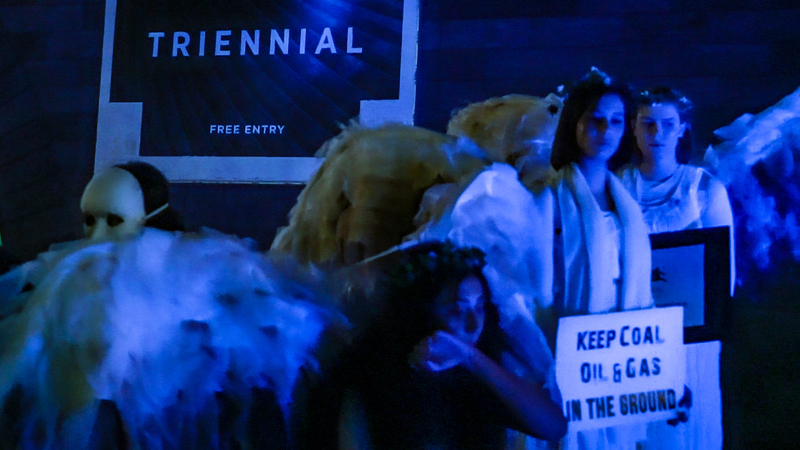 With thanks to all of our hardworking Angels in and out of costumes, and for many of which this occasion was their first experience of Direct Action. *to coin a phrase from the successful, artist driven #WilsonMustGo campaign that led the NGV to terminate its relationship with Wilson Security over the company’s record of human rights abuses in Australian refugee detention centres on Nauru and Manus Island.